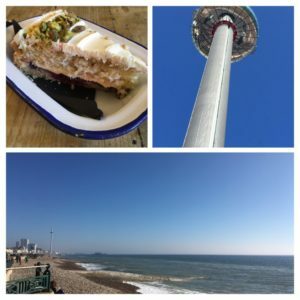 Brighton half marathon 2019 weekend- what a scorcher! 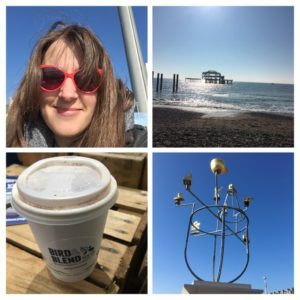 I think my love of Brighton in general is pretty clear- it’s such a lively place to visit, you can walk along the seafront to Hove, you can have tea and cake in a cafe, and their sporting events always attract such good crowds. 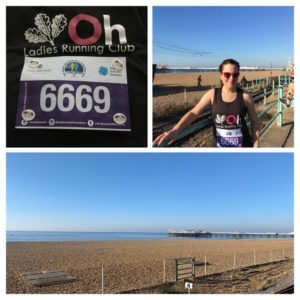 I didn’t do the half marathon last year because I signed up to Cambridge instead, but I really missed doing the Brighton run, so signed up to 2019 asap. It turned out to be in half term (often it’s the week after) so it meant we could head down on Friday afternoon, and check in and get to Bird&Blend for a drink before it shut. Just look at the weather that was predicted- Easter weather! I went for a special of a Black forest latte- very good indeed. Initially I wasn’t going to go to parkrun, and when I mentioned this to Andy I said I thought they were all a bit too far away (usually I would run to them, and run back, but the day before a training run is different to the day before a race and I wanted to be sensible) but he started googling it (I think probably knowing that I would be maybe a teeny bit less cheerful if I missed my parkrun fix) and it turned out that Preston Park was just over half a mile away, so I decided I would head there and go slowly. 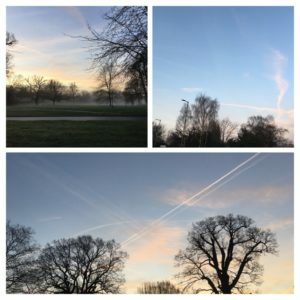 It was such a beautiful morning with bright blue skies and just a gentle breeze. As I was meeting Andy for breakfast straight after, I’d taken a top to wear over my t-shirt, but within minutes of my (very gentle) jog to the start I was boiling and had to tie it around my waist. I love that they have the estimated finish times at this parkrun, as it is a busy one (just under 500 runners this week)- I made sure I started close to the back and just took it steadily. A couple of weeks ago on a Monday my knee felt a bit dodgy, so I made sure that in half term I didn’t run too far, and had a day off between runs, so I did wonder if running 2 days in a row would be OK, but I just kept it steady and enjoyed the laps of the course, finishing in 32:38. Then it was off to Cafe Coho for pancakes and people watching (we got a window seat), back to the hotel for a shower, and then out to enjoy the sunshine. 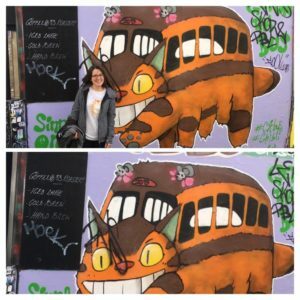 On the Friday night I’d seen this cat bus mural, and I’d happened to pack my cat bus t-shirt, so I decided I had to wear it and have my photo taken in front of it! Totoro was even being shown on Film4 on Sunday. Of course to make sure I was staying hydrated I got a drink to take with me on our walk (this time the classic chai latte) and then we sat on the beach for a bit before walking along to Hove. It was a bit windy (as you can tell by my hair!) but so warm and sunny. We popped to Pret to share a wrap for lunch (not needing anything too big as we had a late breakfast) and then had some tea and cake a little later- this was a gorgeous lime and pistachio cake. Dinner was at Food for Friends (a really nice veggie/vegan restaurant) and a fairly early night then called, with me putting my race number on my vest and making sure my kit was ready. I didn’t actually measure the distance from our hotel to the start, and ended up doing a bit of a panic jog to the start, only just getting to my pen in time, but no matter, I wasn’t using the bag drop or the toilets so I just needed to be there. I had looked into a 2 hour time (the easy to remember 9:09 mile splits) and thought I would follow the 2 hour pacer and see how I managed, but the pen was so crowded that I couldn’t even see the pacer once I was in there. The route was slightly different, heading along the coast first (whereas when I have done it before, we head to the pavilion first, then east along the coast, then west to Hove and then back). I am not sure if this made it feel busier, because the part to the pavilion is wider and so the runners thin out a bit more. I found the first few miles very crowded and I was getting a bit frustrated as I kept getting stuck behind people. I did love it that just after the 3 mile sign I heard a guy say “is that half way?”… Anyway, I found it super crowded and at first I thought that it would be fine and I would run these miles slower and then speed up later, but then I think my first few miles were too slow for that, so I decided I would just enjoy the run, the sunshine, the crowd support, and not stress about the 2 hour time. 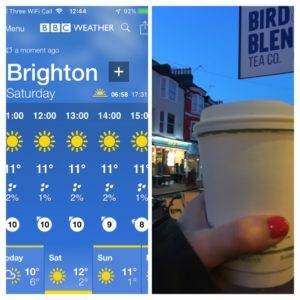 (The route is basically 3 and a bit miles east along the coast, gently uphill and flat, turn back and come back to the centre, have the 7th mile going up and down by the pavilion, then head west along to Hove for 3 miles, turn and then come back). I didn’t notice many of the mile signs- I saw number 4 which said something like “more downhill- wheee”, and at mile 10 is said something like “Hove prom awaits”, but sometimes I’d glance at my watch to check on the pace and notice that another mile had ticked by. As I have said before, the crowd support was brilliant and I saw so many funny signs. There were a few groups of drummers out, and as you go out and back you passed them a couple of times. I always find the bit towards Hove the tough point, as you know you are going to turn (and can see runners heading back by the seafront) but it feels like a long way before you do. I don’t always have a drink in races, because it can make my stomach feel all sloshy, but it was hot so when I saw a water station coming up after 9 and a bit miles, I decided to stop and have a few sips. (Side note- they used paper cups which is so much better for the environment, and at the finish you got a can of water which, as it said on the can, can be recycled forever. But I didn’t always see signs for the water stations coming up, so suddenly people would be running across and the poor volunteers were all shouting saying that more water was further up). After the water stop (there were others) it wasn’t long before we turned and saw the 10 mile sign- just a parkrun to go. I think at that point I was at about 1 hr 35, so I knew that I wouldn’t be able to run the final 3.1 miles in 25 minutes (seeing as I can’t run a parkrun that fast) so I just enjoyed the sights, listened to people chatting, looked for funny signs in the crowds and just felt happy running in the sunshine. I think the unexpected heat had taken some people by surprise, and I saw a fair few runners being treated by the side of the road. 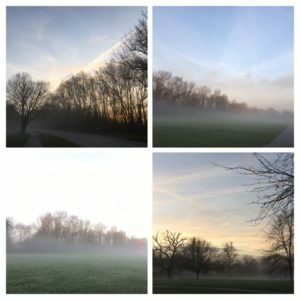 With about half a mile to go, I suddenly felt really dizzy, sort of if the inside of my head was spinning to the side, so I slowed up and nearly stopped, trying to take some deep breaths- I didn’t want to be one of those runners. I felt OK so I carried on to the end, although I must have been overtaken by loads of people having sprint finishes- I didn’t fancy risking it. Just after I crossed the finish line a runner needed treatment at the finish line so they started moving everyone over to one side. I was given a medal (and the lovely lady told me she loved my sunglasses, but all I could do at that point was say thanks- I was trying to say thank you for volunteering but again I felt a bit weird). There were cans of water (as it said on the can, a can can be recycled forever) and bananas (hooray), foil blankets and energy gels, which I left. I had the water and banana asap as I thought I probably needed them both. It feels like you walk a long way after finishing before you can exit the finish area and start to walk back. I took a few photos and then called Andy- he usually meets me at the finish but because the start time had been moved back (because of the train line being closed) we were not sure I’d make it back for a shower before check out. I was glad of the foil blanket because Andy had my jacket, and when I looked on google maps and found the quickest route back was 1.5 miles I did suddenly feel rather weary. I stopped off at Caffe Nero and got a cup of tea which helped. Rather brilliantly, when I got back to the hotel, I had missed the check out but they had put on an amazing service where you signed up and were given a room to use for a shower (it had a huge pile of towels in it), so I could have a shower before we went to get some lunch. My official time was 2:03:38- when I did it 2 years ago I finished in 2:03:23 so at least I am fairly consistent! But the most important thing was that I really enjoyed this race- I love running in Brighton. 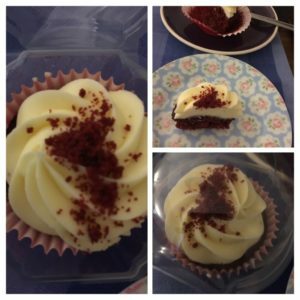 We went to Leon for a quick lunch and then on the way back to the car we walked past Cloud 9 so I got us a little cupcake to share after dinner. 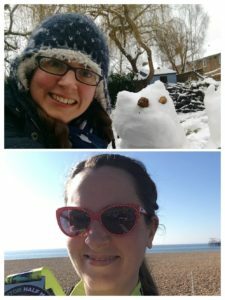 And just to finish, here is a picture that google photos came up with- two pictures one year apart- anyone remember the Beast from the East? 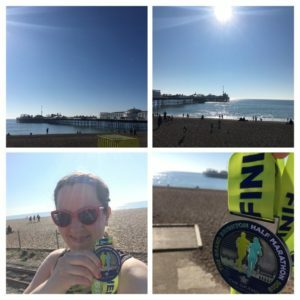 Author Maria RunsPosted on February 28, 2019 Categories General ramblings, Running, Stuff I love!6 Comments on Brighton half marathon 2019 weekend- what a scorcher! After the 10 mile run on Sunday I was feeling fine when I got back, but later in the day we went out on a walk, and then as soon as we got home I started doing some things on the computer (I have to change my name on my passport, and that started off a whole chain of name-changing paperwork), and after that I felt really stiff. I ended up icing my lower back to see if that would help, but still on Monday morning I was still finding it hard to put the weight on my left leg because the pain was going down the sciatic nerve. I decided to try and ease it out by doing some yoga, so I went onto You Tube and came across a couple more videos that Josie, my yoga instructor, had uploaded, so I worked through the shoulders one first, then the hips one, and finished with a little foam rolling, and after all that I felt loads better. I had to walk around to the Post Office (posting off passport and driving licence forms) and decided to extend the walk for a few miles. I ended up walking about 4 miles, and felt back to normal again- something about yoga is rather magic. The Pudding Stop now do bake at home puddings, and a while ago I had bought a couple of their cookie dough puddings and put them in the freezer, so as a half term treat we decided to have them on Sunday evening. They were amazing- crispy on the outside and gooey in the middle, although I think we could have just shared because they were super rich. I had a fair bit of work to do, so I decided to try and get it all done on Monday so I could just relax for the rest of the week. I also started on the long list of companies to contact in order to change my name (our wedding certificate finally arrived- the first one got lost in the post). I had to go into Halifax but it was all OK (the US certificate confused them a little but it went through in the end) but then after getting home and ringing up John Lewis (as I have a card with them) I was told I needed to go into the store and show them the certificate- I had just come from town! Never mind, I can always walk in later in the week (so I decided). 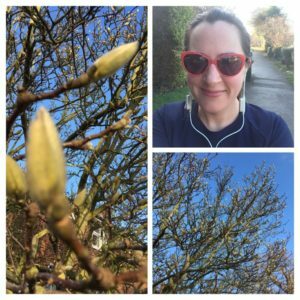 On Tuesday morning I headed out on a run and it was just beautiful- a little chilly (my hands got very cold) but so sunny- I even cracked out the sunglasses. I saw so many signs of spring, including a huge magnolia covered in buds. 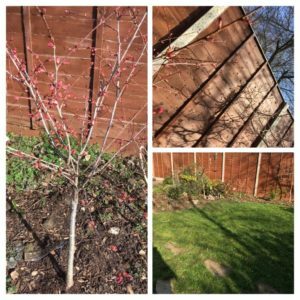 I am sure I read somewhere that because of the type of winter we have had, the spring is going to be very colourful this year. 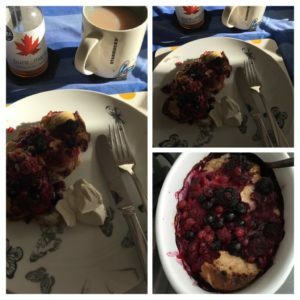 I had a massage booked for early afternoon, so decided to have a big breakfast as then I wouldn’t need lunch (I can’t eat lunch before laying down and being pummelled…) so I made a sort of baked French toast with a hot cross bun and some summer berries. I then got into super efficient mode- Monday was for work work, and Tuesday was for home admin/work. I cleaned the windows, I cleaned my trainers and trail shoes, I vacuumed out my car. Now, I am not a person who keeps a lot of junk in their car- I cleaned it out and that meant I had to throw away one old parking ticket and one old air freshener- but in the passenger side pocket I found this small tube which contained a teeny pair of reading glasses. I was so confused. I hardly ever even have someone in the passenger seat; Andy, my dad on the way to a parkrun, and maybe someone from work/ a friend if I pick them up on the way somewhere. My dad does have reading glasses, but not like these ones, and also he wouldn’t take them with him to a parkrun (he doesn’t even remember to bring them if we go out to eat to read the menu with). I can only think that when the car last had it’s service, one of the mechanics left them in there (as they fill in the little book?). It’s a mystery, and now I don’t really know what to do with them. I also attempted a few more name changing things, sending off the car log book and sending off for a form from the DVLA to change my driving licence. Jobs ticked off, I drove over to St Albans and walked into town (I park around 1.5 miles from the town centre) ready for my massage. 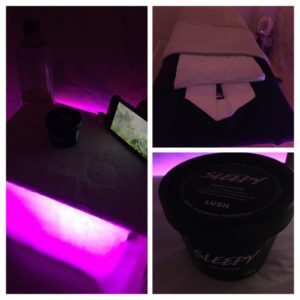 It is always so very needed- it is mostly relaxing despite it being deep tissue and working through all the knots I seem to get on such a regular basis. The therapist used this gorgeous lotion from Lush, and after it finished I popped into town to pick up a few bits, and was complemented by a sales assistant on the vanilla smell. Even though I had some very painful parts to the massage I really felt like I could have fallen asleep on the table at the end! On the way home I took my car to the car wash- I always find it super awkward and I have no idea why- I mean, where are you supposed to look when they are hosing down your car? More jobs ticked off. On Wednesday I did the same yoga workouts again first thing, and then spent the day with relatives- first Andy’s sister in law (is she also my sister in law? ), our niece and nephew, and then my mum. I got home in time for a walk in the daylight, and then we were off to the cinema to see Green Book. I was worried it would be a bit heavy going, because of the subject matter, but I really loved it, and found the relationship between the two main characters really engaging and endearing. Yes, there were some appalling parts to the story (one of these is in the trailer when the musician is told to use the toilet in the shed in the garden), and the fact that some of these things still happen 50 or so years later is also shocking, but overall I found it to be very enjoyable. 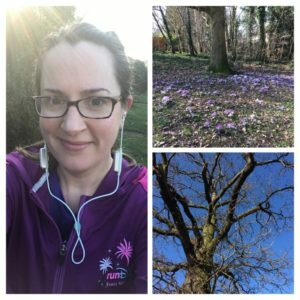 On Thursday I headed out for another run- my favourite 5 mile route, making the most of the cooler weather by wearing my long sleeved Run Disney top (from the 10K race)- and then had some lovely bircher muesli after my shower (I basically soaked some muesli and chia seeds in soya milk while I was out running, and then added some nush almond yoghurt when I got back, stirring it around to make it all the same texture). 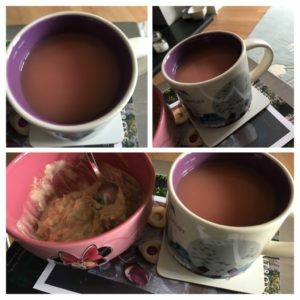 I also had some red velvet tea, which turns pink when you add milk- it was the same colour as my Minnie Mouse bowl although I couldn’t quite get the lighting to show it properly. 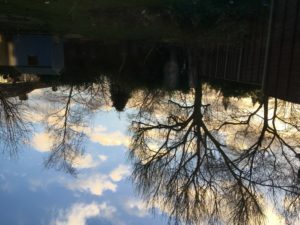 I had a few more jobs to get done and spent a bit of time in the garden, cutting up some bits of wood to take into work and topping up the bird food. It was another gorgeous day and it was so good to be spending time outside, pottering about. 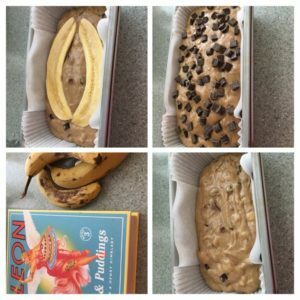 I had some rather brown bananas and of course the only thing to do with them is to make banana bread- I used the recipe in the Leon cook book which in addition to mashed up bananas had a banana sliced length-ways and baked in the middle. 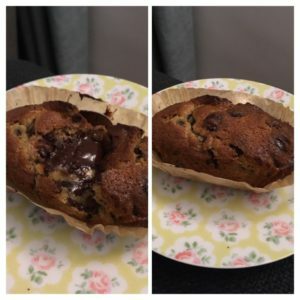 Of course I sprinkled some chocolate chips on top because banana bread with chocolate chips is king. Later I walked into town, ready to pop into John Lewis with my marriage certificate, only when I got into the store, they told me they couldn’t change my details in the store, and I’d have to call customer services- I phoned them on Monday and they told me to go into the store- argh! I also tried to change the name on my Post Office card (I just use this when on holiday as it has a better currency converter rate) but they didn’t know how to do it either and told me to maybe look online (which I had)- this is turning out to be harder than I thought it would be! 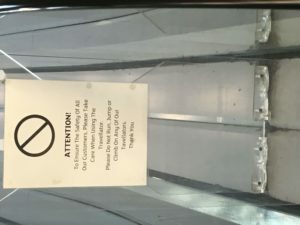 I had to get a few bits in Sainsbury’s and this sign (which usually makes me laugh) just annoyed me- if you have invented a word (travellator) then at least spell it consistently throughout the sign (they miss out the r at the bottom so it turns into a tavellator). 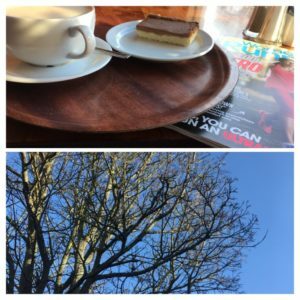 I decided a sit down and a read of a magazine was needed to cheer me up, so I treated myself to a chai latte and a caramel shortbread (although I was going to get a toasted tea cake, and then in the queue convinced myself that they were burger buns- why would they be in a cake stand then Maria?? ?- and so at the last moment chose a caramel shortbread, and immediately after noticed the writing on the cake stand announcing the tea cakes- eye rolls at my silliness) and time to read my magazine and people watch out of the window. Once home, John Lewis called to let me know of the address I need to send the form off to (because why would it be available on the website, or why would I expect the customer service people in the store to know this??). 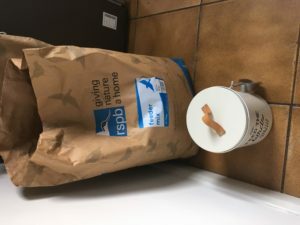 I had to laugh when I got home because I had ordered some bird food for the garden- last year I got some big-ish sacks, and the RSPB website were doing 30% off the sacks last week. It turns out what I was picturing and what turned up were very different in size- I think this sack will keep the birds in the garden going for a very long time- luckily I can make a bit of space in the utility room for the seeds! In the evening I went out to dinner with some friends- I chose hummus to start and it was an enormous portion- I had a fair bit but of course needed to save space for the main, and so when the waiter took the rest away he asked me if anything was wrong with it- I had to explain that it was delicious but just huge (whereas everyone else had starters that were more like normal individual portions)- I am sure if Andy had been with me we could have shared just fine. 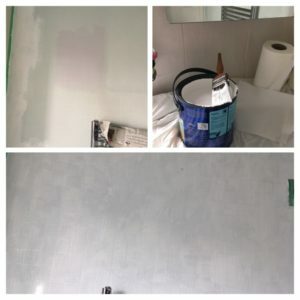 On Friday morning I painted the ceiling and wall of our bathroom- it has needed doing since we moved (nearly 3 years ago now) but we just keep putting it off. As we are off to Brighton it seemed like a good time because it can be left to properly dry. If you reached the end of this post- well done indeed! It seems I have managed to fit a lot in to this week. Have you had hassle when changing your name/ address? (The address change was annoying enough but this seems so much harder somehow). Do you like decorating? I am happy with a paintbrush but I cannot stand wallpaper stripping. 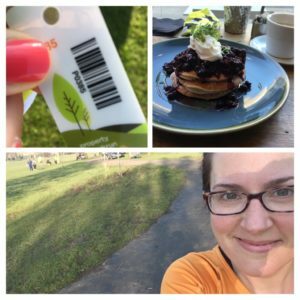 An all time parkrun pb and celebrating with cake! On Saturday I left the choice of parkrun up to Dad, so we decided to meet at Ellenbrook fields. I hadn’t left particularly early so by the time I parked I had time for a quick warm up jog around the streets (basically going the long way around from the car park to the start). As I walked in I saw Lynne, one of our regular volunteers, and mum to Danny Norman (from With Me Now/ parkrun show podcast)- he had mentioned it was her birthday this week so I stopped to have a quick chat with her, before seeing Dad and Tony locking up their bikes. Dad decided that he wanted to run on his own as he wanted to work on his fitness a bit, and if we run together I am slower so it isn’t such a workout for him. I decided I would try and keep him in my sight for as long as possible, and I managed it for around the first mile. 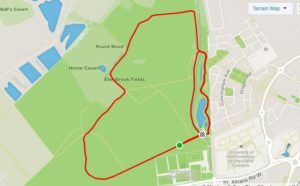 I was wearing a long sleeved top over my t-shirt but I soon warmed up, and the beauty of Ellenbrook Fields is that you do a small loop of about a mile, which brings you past the finish area, before you head off for a longer loop. As I was running I took the top off, tied the sleeve and then as we ran past the finish area I briefly slowed to loop it around one of the fence posts. As I was running I overtook one of the runners from my club, and she is normally a fair bit quicker than me, but of course you never can tell because she might be running slower than usual. I did feel like I was going quite fast, but I also felt OK, and could speed up to overtake people as I came across them. I’d worn my old road trainers in case it was a bit muddy (I couldn’t wear my trail shoes because I hadn’t cleaned out the mud from last week) but the ground was OK- fairly firm and although a few bits of mud here and there, no huge puddles to avoid or anything. The final km is along a runway and I can make the mistake of speeding up too soon, as you feel closer to the finish than you actually are, so I told myself that when I reached the start area, I would speed up. As I reached that part I could hear someone coming up behind me, breathing really heavily, so I decided to try and speed up and try to stay ahead of them. I ended up speeding up and was so close to catching the lady in front of me, but I was within a metre or so of the line and it felt rude. As she reached the line, she stopped dead and I nearly crashed into her! She mumbled something but didn’t move (and the funnel is a good few metres long) and was fiddling with her watch- I should have overtaken her after all! As I walked to collect my token I stopped my watch and immediately got a notification on my watch saying new record. I then saw that my time was 26 something, which I hardly ever manage (I’ve managed it 5 other times), but I couldn’t remember my pb so it was a long wait for the email to come through! I asked Lynne if I could have a picture with her (in her cow bob hat- something that her son isn’t a big fan of) and we chatted a little longer before I met up with Dad and Tony. 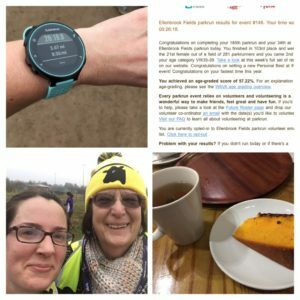 I then went over to my parents and Mum cooked us pancakes, and we then watched the Watford match (they had taped it from Friday as they had been out)- it was near the end of that when I received the text and email confirming a course and all-time parkrun pb of 26:18! It beats my best Ellenbrook Fields time of 26:33 set in April 2017, and it also beats my all time pb of 26:29 set at St Albans way back in November 2013! But the best thing? My penultimate number for stopwatch bingo! The final number I need is number 17 (eg a run finishing with 17 seconds). My splits were 8:44, 8:37 and 8:27, so a nice royal flush there too. After heading home and having a shower, we walked into town and decided to have some cake to celebrate. There is a lovely looking cafe in the town centre, but we have never been to it, because either I have made a cake, or we have John Lewis cake vouchers to use up, but this weekend I didn’t have anything left over, and John Lewis are a bit more stingy with the cake vouchers now (you used to get one a month, but now one is valid for 3 months). Anyway, the cafe had so many amazing looking cakes, all made on the premises, as well as loads of tasty sounding wraps and sandwiches. I went for a peppermint tea and we shared a piece of orange and chocolate cake which was delicious. On Sunday morning I headed out for 10 miles, keeping it easy with two 5 mile loops (I have learnt the 5 mile loop now). It was so gorgeous out there and I wished I’d worn my sunglasses. My legs did feel heavy, but after running so fast on the Saturday that wasn’t a surprise. Hopefully it hasn’t negatively impacted my training at all as I did complete the run and felt fine. I saw so many signs of spring including a lovely carpet of crocus flowers in some woodland near home. 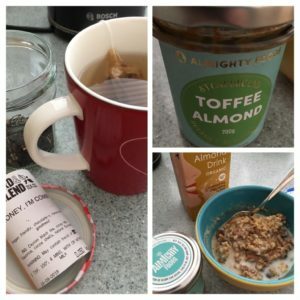 I’d made some porridge the night before because I knew I would fancy something quick when I got back- oats, chia seeds, cinnamon and raisins soaked overnight in almond milk, cooked for a couple of minutes and then topped with almond butter (which is so amazing) and a little extra milk. Plus of course some tea (Honey, I’m Comb). Then it was on to enjoy half term! Do you get pb’s very often? Out of 185 runs I have managed 13 pb’s (and some of those are course pb’s and not overall ones, because I’ve run at several parkruns than once). If Dad and I chat to a new runner at parkrun we always tell them to start out slowly, so that they can chip away at their time each week, whereas my first parkrun was a 5k attempt for Jantastic, so I ran 27:12 which still now would be a speedy time for me! 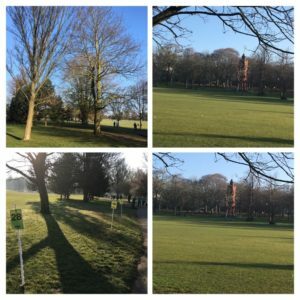 Author Maria RunsPosted on February 21, 2019 Categories General ramblings, Running, Stuff I love!8 Comments on An all time parkrun pb and celebrating with cake! On Monday after work I had a short walk to stretch out my legs- they weren’t feeling too bad after the 14 miles on the Sunday, but I had worn compression sleeves all day just to help, and I think a walk always helps to ease out any stiffness. 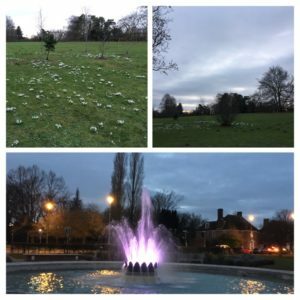 On Tuesday I made the most of having no meeting (due to parents evening later in the week) and stopped on my way home for a run- it wasn’t quite dark when I set out, and it felt like spring might be around the corner as I spotted lots of snowdrops. On Wednesday we had meetings all evening, so I decided to head out at lunch time to get a bit of sunshine. 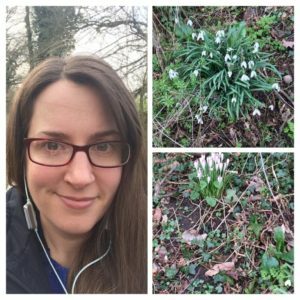 I saw loads more snowdrops and spotted so many birds out (I was walking mainly through woodland). Usually lunch times are so busy setting up for the afternoon and catching up on paperwork, but I try to get out once a week if I can and it always makes such a difference to how I feel. 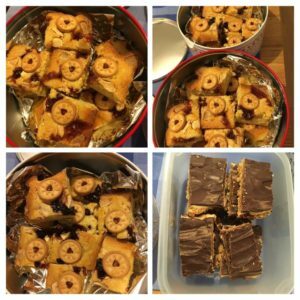 I had sorted my baking into tins for each day- some blondies for the Wednesday meetings and then the caramel shortbread for the Thursday (saving the best ’til last). It seemed to help everyone get through the extra busy week! 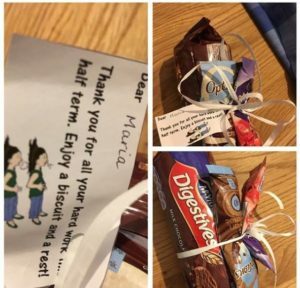 The teachers at work were treated to a little package from another member of staff- these were left for us in the staffroom before the final parents evening and it was just such a lovely gesture (and I also loved the picture of the person collapsed on their back- it can feel a bit like that by the end of each term!). On Friday I was meeting a friend at The Waffle House. I arrived a little early (you can never tell how the traffic will be), so I had a quick walk around the lakes, enjoying more spring sunshine. I had a bit of time to peruse the menu, and decided on the pecan and butterscotch waffle (pecans are baked into the waffle) and then added a banana on top. They had a special warm elder-flower and apple juice, so I went for that instead of my usual tea. Of course the food was delicious, and it’s always so lovely to catch up with my friend and know that we are looking forward to a relaxing week. 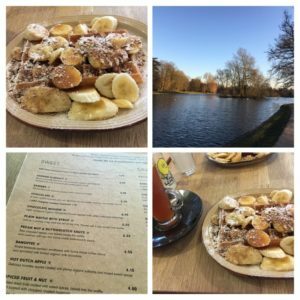 What would your ideal waffle topping be? What do you do in your lunch break? Does your work do anything to help with staff wellbeing? 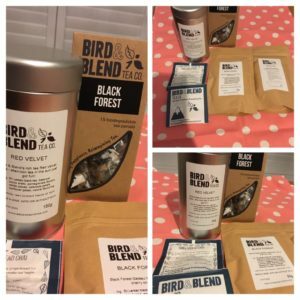 Earlier on last week I caved and ordered some tea from Bird&Blend- I get a little box each month (the subscription thing) but they released their Valentine’s blends (the day after we were in Brighton, I shall note- it seems their launches are always on a Sunday…) and they were all my favourite. They also did something on Instagram which added a little bag of Red Velvet tea to my basket, so I had to order something really. I’ve not tried the Black Forest tea before (black tea with cocoa and cherries) although I had a similar blend from David’s Tea (a Canadian tea shop) years ago, so I had high hopes, and it has not disappointed. On Monday I just had a short walk in the evening (I seemed to have done a million steps at work that day and just had to pop to the post box). I also spent the day feeling really hungry- I think it was from the 12 miles on the Sunday- if I don’t eat something as soon as I get back then I seem to pay for it later (and as Andy’s parents had come over I spent a bit of time chatting to them before showering and then cooking my porridge, so it was probably nearly an hour after getting back that I finally ate breakfast). 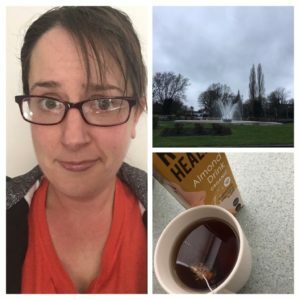 On Tuesday I headed out for a run, and after a few minutes it started raining. I’d not worn a visor but thought I’d be OK. Wrong. 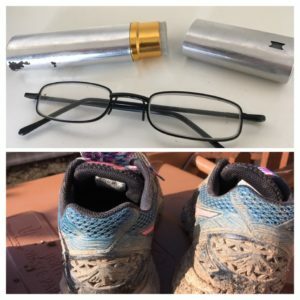 The rain was sticking to my glasses, and then the torch I was wearing seemed to be reflecting off the rain, and also diffusing in the droplets on my glasses making it very hard to see at times- I really had to stop in a few places. Anyway, I got 4 miles done and that felt like plenty as seeing where I was going was such hard work. A little walk on Wednesday morning in the fog and I was treated to some pretty views. On Wednesday at yoga we had a bit of a focus on inversions (being upside-down) and were told to practise the handstand. We go into the downward dog position, move one leg a little further towards our hands, and then kick the legs up- the idea being that if you are super strong and balanced you can get your legs up and hold it (none of the throwing your hands down that other kids did when I was at school). We also practised against a wall, and some people were paired up, with one person holding the hips of the other person to steady them. I have never managed this, but the yoga teacher told me that she would hold my hips and that I was strong enough (on a few occasions I’ve nearly got there and then panicked as one shoulder has collapsed and I end up crumpling onto my head). Anyway, I feel like I don’t kick up very high but somehow she managed to hold my hips and so I managed to hold a handstand! I held it for a few breaths before coming back down and I felt so chuffed with myself. We then went on to headstands- I can only manage the tripod (well I say manage, I can get one leg up at a time)- I am more confident in this though and can hold each leg for a little bit- one day I’ll get there. On Thursday I did a 4 mile run- it was pretty windy out there which made it hard, but thankfully no rain so at least I could see where I was going! 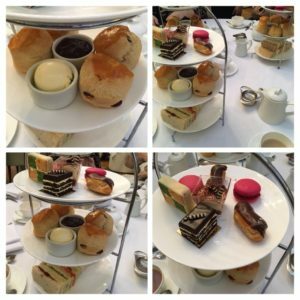 On Friday our team at work were off to have an afternoon tea together. We’d booked a local hotel and spent a couple of hours catching up and relaxing. Before we had got to the scones, a new round of sandwiches were brought out, so we ended up taking all the cakes home for later.
? Up early watching the trees get blown about on Saturday morning. It’s upside down again, what joy. On Saturday Dad had suggested Jersey Farm parkrun as he needed to pick up his car from a nearby pub. I kept an eye on facebook as a few runs were being cancelled due to the high winds, but locally we were all OK. I drove round just as Dad was getting on his bike- he thought I was going to meet him there, but we ended up walking there together, running around (in the mud) and then walking up to the pub before he drove us back. I do like the Jersey Farm route- it’s two laps and laps aren’t my favourite, but it’s varied scenery and fairly undulating, so it keeps you interested. It was very muddy and quite slippery in places, so I was glad of my trail shoes, but then ended up with wet socks because some of it was too boggy. I am pretty sure all the core team listen to With Me Now as they always seem to do arbitrary shout-outs- it was someone’s 400th this week (not a thing..) and they got a clap. Of course it was then pancakes made by Mum, while I heard about their holiday (a cruise on the Panama Canal and then some time in Costa Rica)- all amazing. After driving home and having a shower, I ploughed through my work, and then walked into town to warm up again and get my free drink. 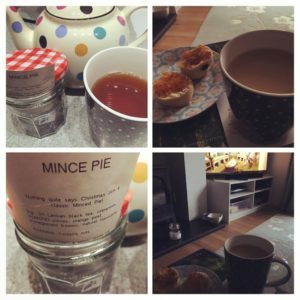 Once home I had some mince pie tea (so good) and a scone leftover from the afternoon tea, and watched a bit of Winter Watch- so relaxing. On Sunday morning I did some more excellent long run maths. 14 miles- so that is 2×7 miles, or two lots of the 3 mile loop and 2 lots of a 4 mile loop. I thought I’d do short-long-long-short loops, but then after doing 3 miles, the longer loop turned out to be more like 5.5 miles (which somehow I calculated to be a bit short). On my second long loop I realised that I would not need the second short loop, because I was already coming up to 13 miles, so I just took a bit of a meandering route back home to make the 14. Honestly I am not sure how I manage to make these things so confusing for myself. It was raining on and off, fairly heavily at times, so I was glad to be home in the warm, but made the mistake of getting in the shower too quickly. My skin just felt like it was on fire and got so itchy. After getting out I realised that my skin was basically the same colour as my orange top- not good! Time for porridge and tea to properly warm up. 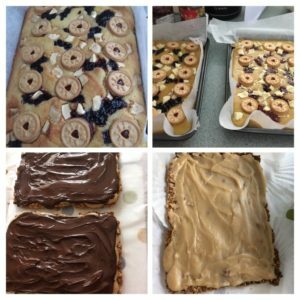 I’d planned some baking for work this week, but in town on Saturday I had forgotten that I’d run out of baking paper, so after drying my hair I popped around to the local shop to get some, before getting baking. I’ve not had a proper baking day in ages and it was fab. I made two lots of caramel shortbread and two lots of jammy dodger blondies as they always prove popular. In a bit we are off to see the new Lego movie- I think I’ve earned a little sit down (and hopefully my legs won’t get too stiff). Which bit of afternoon tea is your favourite? It’s always the scones for me, and of course tea in a pot. Which bakes go down well at your work? White chocolate seems to always be popular with my colleagues.